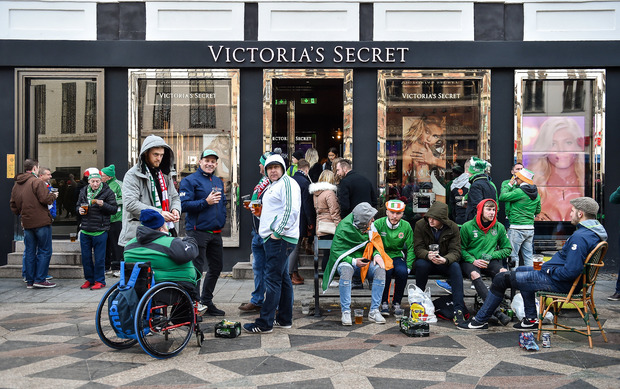 A selection of Irish fans have gathered outside the Victoria's Secret store on the Amagertorv ahead of the first leg of Saturday's World Cup play-off against Denmark in Copenhagen. The Victoria's Secret store is located directly beside The Dubliner pub, 'Copenhagen's most authentic Irish pub' according to the venue's website. A couple of eagled eyed Irish fans set up camp outside the front of the womenswear store, armed with chairs and Lidl shopping bags, and before too long they were joined by more Irish fans who also decided to spend their afternoons socialising outside the store. An Irish supporter in Copenhagen has issued a warning to other travelling fans after he was pick-pocketed at a popular nightspot in the city. Ger Keville - who works as sports editor on this website - was with other supporters at The Scottish Bar in Copenhagen when he realised that his phone and wallet had been taken from his coat. The Scottish Bar was packed with Irish fans, who have come to the city to see Martin O'Neill's side take on Denmark in the first leg of the World Cup playoff tonight. Keville thinks that the thieves blended in amongst the patrons at the busy bar, scouting for victims. "Irish fans should be vigilant, I usually look out for these sort of things but you don't notice these guys," Keville told Independent.ie. "It was a busy pub and a few minutes after I paid for a drink, my stuff was gone. I put my jacket down for ten seconds. They must have been watching us." If Irish fans require assistance, there is an embassy in Denmark located at Østbanegade 21, 2100 Copenhagen Ø.